Each week, I try to reflect on the more spiritual side of life to see how I am growing in happiness and fulfillment and service. It’s easy to track business performance, but not always as easy or automatic to track spiritual or fulfillment growth. So, here I will try to do just that and I then will try to translate that into a topic and today we are Talking Courage. So, this week I was writing a post about my badass Slow Cooker Ground Chicken & Artichoke Ragu. We also celebrated International Women’s Day this week. So, naturally the two worlds merged together and I got to thinking about badass women, which then got me thinking about how I can raise my two daughters so they grow up to be badass women! HOW DO YOU TEACH YOUR KIDS TO BE COURAGEOUS? EXACTLY! This summarizes my hopes for my girls: courage = freedom = happiness. The first thing is to realize is that courage is an emotion, a feeling. It’s not something that you can make your kids be or feel, or even teach your kids or practice with them. Burton goes on to conclude that you can teach knowledge (facts, information, skills) but having the knowledge does not mean someone will act on it. Taking that action is courage. That said, you can GUIDE and INSPIRE others to be courageous. This is where the adage Lead by Example comes from. If our kids can see how courageous you are, whether it’s with small or big things, your children will be inspired to be courageous when they face fears. So, ok I can lead by example, but what does that look like and how will my children understand it? I have done a lot of primary research in conquering fears; i.e. I’ve had to work through and walk through a TON of fears over my years personally. So, I can tell you this..fear is ok, it’s more than ok, FEAR IS NECESSARY. Without fear, there cannot be courage. Walking through our fear is what makes our actions courageous. Understanding that we will grow and be stronger on the other side is the motivation. 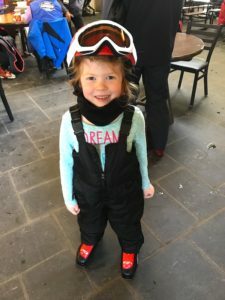 So, my next stop on my courage journey was a beautiful article I found on Hey Sigmund called, Building Courage in Kids: How to Teach Children to be Brave, by Karen Young. Here Young reminds us that kids may not understand fully what courage is and all the forms, big and small, it can take. Kids read books and see movies where courage is fighting the dragon, where the courageous character is smarter or more powerful or even magical. So, they might not assume that they too can have courage. It’s important for us to teach them what courage is and that fear is normal and that walking through our daily fears is courage! Young also points out that we need to teach our kids that failure is ok and even needed if we are to grow and improve at anything. Often times, the fear of failure is what prevents kids from being brave or courageous. 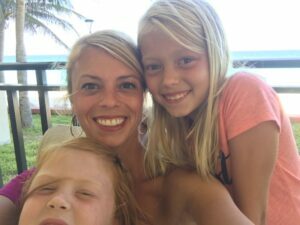 For example, my older daughter has a huge fear of speaking in front of large groups because she is worried that she will stumble or make a mistake or answer incorrectly and then others will laugh at her. 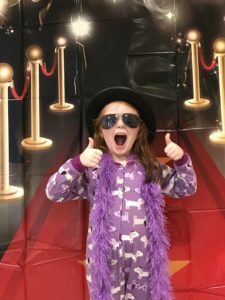 The truth is, they are kids and they just might laugh (and they have) but this “failure” in her mind is perfectly normal and expected and I have been in her exact shoes and I walked through it. So, it’s my job to talk to her about my experiences and the experiences of others to give examples of how there are bumps in the road, but she will learn and grow from those and get better and better each time. The last BRILLIANT point that Young mentions that feel compelled to share with you is to tell your kids what courage FEELS like. Seriously, I never thought about this. For me, I know that courage is only when I’m scared; when I can feel the nerves, the butterflies in my stomach, the hot flashes, the shakiness. When I am able to face those scary moments and tackle whatever it is that is causing the fear, that’s when I am courageous. But kids may not realize that. They may think that they will be overcome with sudden strength and that all fears will disappear, but that is so far from the truth! Therefore, if they know that they will not necessarily feel courageous until after the action, they can start to embrace it more. For my girls, they tend to have more courage when it comes to physical activities because it’s tangible. They get it that if they try swimming, they will learn to swim. 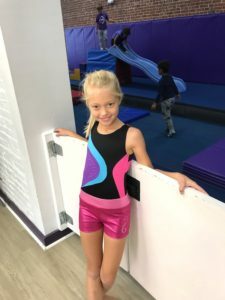 For example, my girls both love skiing and gymnastics and try new daring things every time they have a lesson because they see the pros and how good they are. For me, if I were to try a handstand my fear of tumbling over and literally falling on my head is too great and I talk myself out of it. However, when it comes to public speaking, even in small school groups, many kids freeze or even cry because they are consumed with fear. This has been our experience with my older daughter. She is consumed with fear that the other kids will laugh at her. All I can do to help her walk through this type of fear is to support her, love her, listen to her fears, and share my own experiences as a child with speaking in public and how I got through it. I will definitely also make sure that she understands that being courageous doesn’t mean that the fear will slip away, but rather it will remain until she takes the action of getting up and speaking, but that the more she does this the easier it will be and the less fear she will have each time. I can also practice her lines with her to help build her confidence. But ultimately, she has to be the one to walk through the fear.